> Dust Goggle and Mask set up! Thread: Dust Goggle and Mask set up! Getting your ride ready for the spring? Be sure to get your gear bag ready too! Wolfsnout Ground Force Allsport set, the top of the line! Combo features the best anti dust goggle on the market because we filter the lens with a triple filter system. Designed to fit over your prescription glasses. Also a great dust mask for mowing grass. Great for the pro landscaping dust mask. The Dust is here! Let Wolfsnout keep the dust out. Wolfsnout Dust Mask and Goggles, works with or without a helmet. They work together or apart. You can’t ride hard if you can’t breathe easy. If taken care of they can last for years. Sure anyone can say “easy to breathe” “comfortable fit” “works great under a helmet and with goggles”, but only Wolfsnout® can deliver. 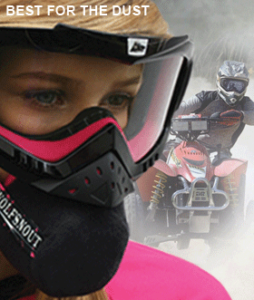 The best off road dust mask in town.